The Holy Cross Sermons: Be on watch! Be Alert! It has become a tradition in the celebrating of ADVENT to focus on four key words that seem to sum up what we are preparing for in the birth of Jesus, the coming of God among us and as one of us. Today our key word is HOPE and there are echoes of HOPE ringing around in the selected Scriptures we read out loud today. Together they seem to be pointing us to something they call “The Day of the Lord,” and while some of the imagery around this great a marvellous day seem to be judgemental and fearful, implicit in the texts is the idea that we who call him Lord have cause for HOPE – even in the midst of terrible and frightening things. Be on watch. Be alert. For you do not know when the time will come. Chapter 13 in Mark’s Gospel is called “A Little Apocalypse” because it concerns the coming of Christ on earth on judgement day, something that theologians call the parousia. This word used by Mark, means “with essence” or “to become present or real.” Christian tradition has also taken parousia to mean The Second Coming of Christ. But in the original mother tongue of Jesus, Aramaic, there is no word for “return” or “to come again.” But there is a word for “appearance”. So the early Christians looked eagerly for the appearance of Christ in power and glory. 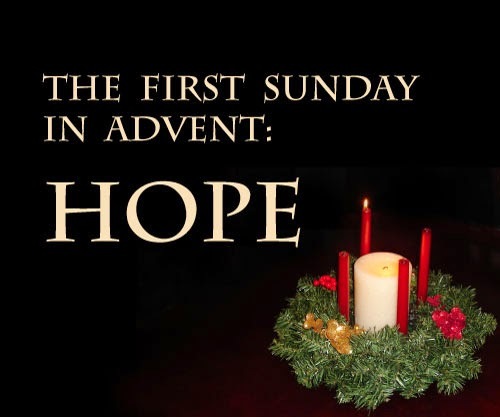 They lived in this HOPE which is picked up as our ADVENT theme today. At the beginning they expected his final appearance to come soon. As time wore on, they decided they would have to be more patient. And they told each other stories that would keep this HOPE alive. In the story that Jesus alludes to, I am sure you could not help thinking of the stories we had over the past few weeks that also spoke of us not knowing when the final judgement would happen. · the cook was to keep busy in the kitchen. This was not a WATCH & WAIT order. It did not mean to sit around anxiously waiting. To be ready was to be busy serving their lord. So this story points to the way that Christ’s followers were to live. They were to BE READY for the appearance of the holy Son of God whenever that might happen. Remember the truth that flows from the story about the master of the house going abroad. This story points the way for contemporary believers. · loving God as we go about loving one another. · and housing the homeless. This is what being ready for the appearance of the Lord means. And only you can judge if you have become so involved in this work of ministry that you can say you are ready. If you made an honest audit of your life and its priorities, would it show you as being ready for the appearance of Christ Jesus? “Are you ready” means today, because today is the moment of opportunity? The business of the master’s house is all around us. It will be a wonderful thing to be awake and ready whenever he comes.